Have you ever dreamed of owning a unique home? Well the time has come for that dream to come true. 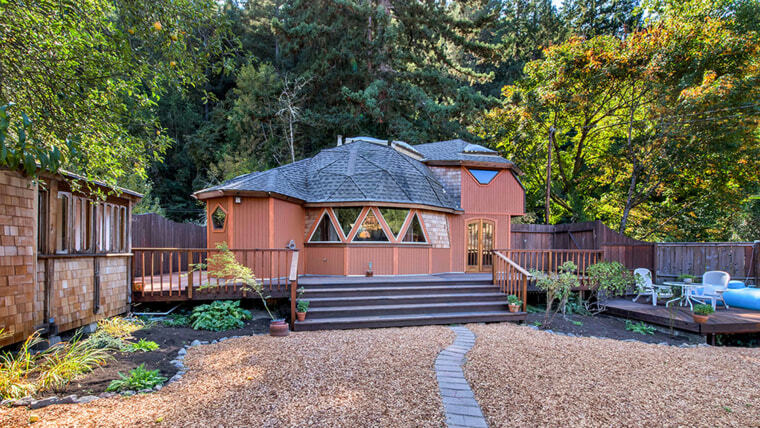 This dome-shaped one bedroom, one bath home was built in 1980 and is located in Guernville, California. The interesting shape isn’t the only thing that makes this house one of a kind. Inside you’ll find geometric wood paneling made out of cedar, which extends from the floor to the top of the dome. The home has newly installed bamboo flooring throughout and an old-fashioned wood-burning heater to cozy up next to during the colder months. “It’s very peaceful when you’re in it. Something about it has this bubble feeling. You feel very safe. It’s beautiful and has a great smell with all that wood,” Theresa Disbro, one of the listing agents on the property, told timesunion. The upstairs bedroom overlooks the rest of the house and has much of the same paneling as the main room. Two triangular mirrors sit in the corners to give the illusion of more space. The kitchen has been fully renovated and includes all new stainless steel appliances. The breakfast bar and two bar stools are used in place of a dining room table. Every detail of the house has been considered, right down to the custom tiling in the bathroom. The nature scene depicts a waterfall flowing down into a stream and onto the shower floor. The home also comes with a separate laundry facility and an additional outbuilding that is the perfect size for a home office. Nestled on a quarter acre of land, the owner more than enough space to enjoy the lush forest surrounding the house from the comfort of the wraparound deck. The home is ideal as a vacation rental or getaway and is currently on sale for $475,000. To learn more, visit Russian River Real Estate.